Amazon.com Price: $23.45 (as of 2019-04-22 02:13:17 GMT) Product prices and availability are accurate as of the date/time indicated and are subject to change. Any price and availability information displayed on Amazon.com at the time of purchase will apply to the purchase of this product. 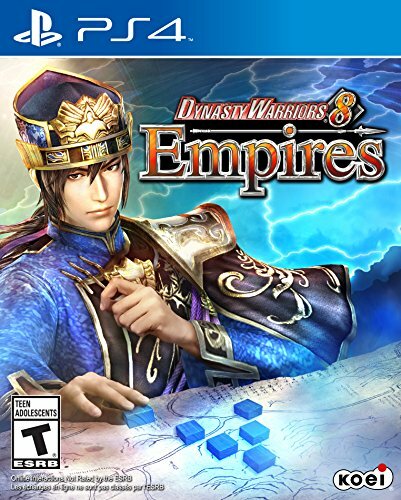 DYNASTY WARRIORS 8 Empires focuses deeply on the chaotic lives of the warriors as their fateful decisions affect the rise and fall of the nations they bravely fight for. Players can select from 83 unique characters, or create their own original character with a plentitude of options through the edit function. The visual customization goes further with the newly implemented ability to customize their horses, banners and “normal” officers. In the returning Empire mode, players can select from one of many distinct roles which are best suited to them or to experience the epic history and its outcomes through a different methodology of warfare in replay. Whether choosing from Liu Bei, a provincial ruler forced to wander the land in search of a home or Lu Bu, an egotistical warrior who moves from one betrayal to another in search of his own glory, players are swept up in the drama of warfare. Courageous warriors trudge through Ancient China with its vast plains, bleak wastelands, narrow ravines and immense castles as they slash through enemy lines. In DYNASTY WARRIORS 8 Empires, warriors must fight against not only enemies but also the forces of nature as the changing seasons bring new elements to the more than 35 battlefields affected by seasons and the passing of time.